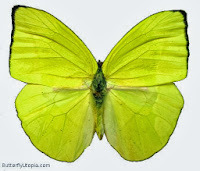 We see a few butterflies flying around our yard everyday and the buttercup butterfly is usually one of them. I think that's what they are anyway. 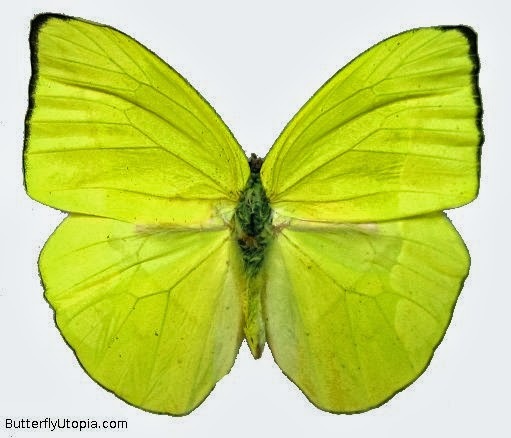 Here's a picture I got from a site called Butterfly Utopia and they definitely look like this one. Anyway, we've been having some cute encounters with these buttercup butterflies in the last couple of weeks whenever we're playing badminton. I don't know much about these cute creatures but it seems that everytime we see them flying around they're almost always chasing another butterfly [of their kind of course]. The little one said it's probably mating season. Hmmm??? Anyhooo...the shuttlecock that we use for our badminton games is yellow, much like the color of the butterflies. What do you know? Our shuttlecock is being chased by these buttercups. It's pretty cute actually that I wish I can capture it on video or take a picture of it. But how can I do that if I'm playing? I may just ask the husband to watch us one time and be the one to capture that. The little one find it very amusing whenever the butterfly dives in when the shuttlecock hits the ground. Who am I kidding....I find it very amusing as well. Won't you??? Ay oo naman! Katuwa talaga to see those butterflies kissing your shuttlecock. It's saddening that we seldom see butterflies around here anymore. At tipong ganyang kind din ang nag-a-appear dito. Anyways.. musta ang score ng badminton? Baka naman talo pa ang nanay ha? hehe..
Hope your having a great week, Huling! Stay beautiful and caring as always. Ingat! Hugs!